In recognition of May as Motorcycle Safety Awareness Month, EatSleepRIDE.com (ESR), a social platform for the international motorcycling community, has introduced a groundbreaking mobile app technology dedicated to motorcycle riders and those close to them. Exploiting iOS native functionality, EatSleepRIDE Motorcycles for mobile is the most comprehensive and advanced iPhone app for motorcyclists, making riding social and safe. CRASHLIGHT, a revolutionary built-in safety crash detection technology automatically detects a motorcycle accident and notifies the riders pre-set contacts of their geographical location. The rider never needs to ride alone. Now friends and family can have peace of mind knowing they will be connected when things go wrong. Developed in conjunction with the University of Toronto, CRASHLIGHT exploits built-in sensor technology using sophisticated algorithms to detect a motorcycle accident. The App then notifies contacts via SMS text messages, phone calls and email to ensure the transmission of the message to the recipients. EatSleepRIDE Motorcycles further enhances the motorcycle riding experience through a data dashboard enabling visualization of recorded routes, speed and lean angle. Editorial and crowd-sourced content make it easy to connect and share experiences with like-minded motorcycle enthusiasts. GPS-based social riding features make it possible for riders to see each other’s whereabouts on a map. Geo-proximal search instantly finds motorcycle roads and biker friendly places nearby. 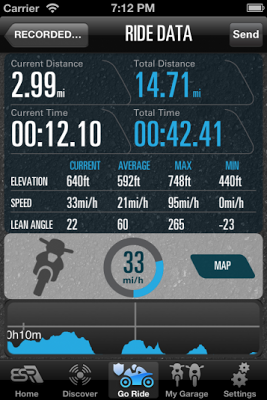 EatSleepRIDE Motorcycles for mobile is currently available for iOS devices, with an Android version coming soon. For more information on the app visit EatSleepRIDE or contact Alex Carroni on alexcarroni@brandorb.com.